After posting the comparison of three popular online survey tools’ free versions, many have requested a similar analysis of paid online tools. It seems there is a new tool coming up every day and comparing them all would be a rather difficult task. I decided to compare three online survey tools I have used most recently for different projects. I have been using SurveyGizmo for a while now. As I said in my previous post, it is a great value given the number of features it offers at a very affordable price. The tool has been improving with time so it was a natural choice for comparison purposes. Not long ago, I saw a demo of Beacon by Decipher and was pleasantly surprised by the advanced features if offered and the business model that supports it. Most online survey tools require either a monthly or annual subscription, but Beacon does not. You only need to pay for completed surveys. I decided to give it a shot and used it to program a pretty complex survey. I had the chance to become very familiar with the tool, and thought it was worth including it in this comparison. Finally, since my above mentioned post about free online survey tools, I have had many requests asking me to review Qualtrics, which is also becoming quite popular. I happened to use it in two recent projects with very different requirements, which gave me the opportunity to test it in depth. For a comparison between SurveyGizmo, Qualtrics, and SurveyMonkey check the post: Three Popular Online Survey Tools – What You Get For Your Money. The list below includes some of the most often-used features in moderate to advanced survey programming and, as you can see below, all three online survey tools are pretty powerful and comparable in many aspects. That said, none of these online survey tool is perfect, and they all would benefit from continuous improvement in capabilities and usability. Most of the time they do the same thing in different ways that have an impact on users’ learning curve. I find SurveyGizmo to be the most user-friendly and you can do pretty advanced programming with it. They have been adding new question types and integration partners. However, the data export to SPSS and result reporting feature need improvement. For some reason multiple choice questions get some random variable names that don’t match the variable name specified in the survey, when they get exported to SPSS. Variable names don’t show up in the online reports either. Also, I wished they included statistical testing in their crosstabs. 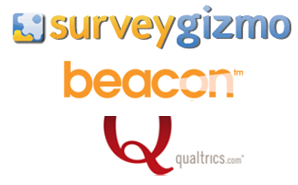 Qualtrics is the second most user-friendly survey tool of the three. Some things are not obvious. I like the large number of question types. Many are variations of standard questions with horizontal and vertical layouts, with and without images. Among the question types, you will find Constant sum tables, Heatmaps, Hotspots (The latter is pretty useful in concept testing) and MaxDiff (assuming you already have an experimental design). They recently added a new reporting tool, which is still in beta. I like that you can add banner points to the crosstabs and drill down through different question layers, unfortunately it is still not very intuitive when it comes to create different table types. Beacon is a powerful tool, but the learning curve is a bit steep. Thankfully, they have a very responsive technical support, and I was able to get answers to my long list of questions and issues, very quickly. What I liked the most about Beacon is the flexibility it offers to create very complex skip patterns and validations. I also liked its crosstabs. They include counts, percentages, means and Top 2 Box with statistical testing. Initially I was mostly bothered by a somewhat cumbersome process for previewing and testing surveys, since I think these are basic features, but they have recently simplified the process and made previewing and testing much more easier and user friendly. A minor thing I don’t like, that is more about my own taste than anything else, is that all questions have a table format and there is no way to change that. The tool seems to have been developed by and for programmers since the environment is not very intuitive for neophytes. You can spend a lot of time trying to figure out how certain basic features work. Regarding cost, each online survey tool uses a different model. SurveyGizmo’s subscription can be monthly or annual (the latter gives you a 10% discount). Beacon doesn’t require a subscription, but charges $0.75/complete. This may be a good deal compared to SurveyGizmo as long as your project’s sample or the total sample across different projects is 100 or less. If you go over 100 respondents, SurveyGizmo would be a more economical alternative with unlimited completed surveys. Qualtrics is the most expensive of the three. The number of completed surveys will depend on license cost and you have to commit for a whole year, so consider your research volume before making such commitment. However, if you have need of some of their unique question types (e.g. Hotspot), it may be worth it. As I said before, no online survey tool is perfect. All have quirks when you get into the details. The decision to use one or the other should be based on how well they meet the needs of the project you are working on and what the budget is. You’ve created the best survey feature comparison list I’ve even seen! How can my online survey tool https://www.phpforms.net get reviewed here? Thank you for your feedback. We review new tools from time to time as the need arises and time permits. I’d be interested in seeing a demo of your tool. I’m curious – have been using LimeSurvey (limesurvey.org) and am finding it extremely good. As a standalone, open-source solution, it’s effectively free (or the cost of a server in the cloud) and with an amazing amount of flexibility. Already hosted versions are readily available and are low, low cost. How would you rate this in comparison to other tools or have you not come across it before? If the latter, are there other full open-source solutions which you would recommend. The tools mentioned in the list are good but i think it still is incomplete without http://www.sogosurvey.com as it is ideal for users who may be new in the field for survey creation and very helpful to those who do researches with surveys. They even provide accounts to Non-Profit organizations. It may not be the best but certainly knows what it’s upto. Its affordable and really easy to setup, it also has all the advanced features that any surveyor would require. I did a search on Qualtrics but I got over 250 responses and I can’t find a way to buy this more questions. I sent any emails but they don’t respond.. Anyone know how to buy all the answers? This is an excellent review; I really enjoyed this article and immediately subscribed to your blog. I have been in the software for market research business for almost a decade and this is one of the best software comparisons I have ever seen. I represent Q-FI Solutions; we are Market Research technology company. We have just launched a new survey platform with unique capabilities. I would love to schedule a live demonstration at your convenience. Please advise of your interest. SamDaniel: the ones you mentioned offer many fewer options and although more accessible in price are not nearly as good if you’re willing to lay down the money. Hi, such a wonderful review. I wonder what is the currency for the price of the subscribing the tools? Is it presented in USD? Yes, it is in USD.